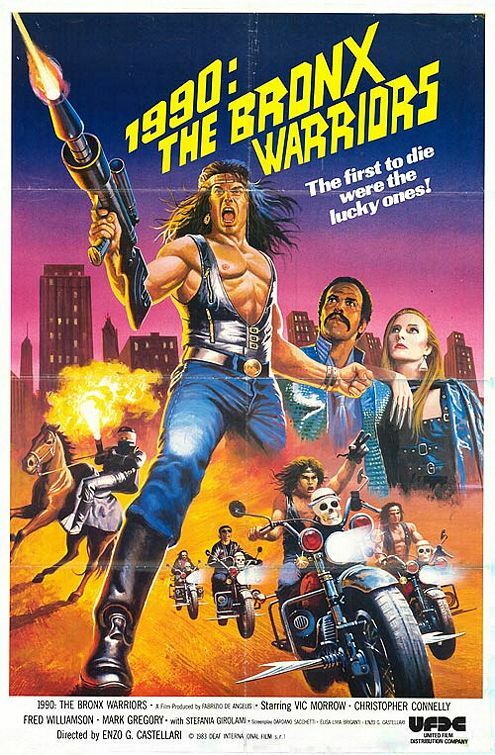 Remember The Warriors? Remember Escape From New York? Those two films saw a lot in each other, they saw so much they went on a date, got a bite to eat, went for a long walk on the beach. Then they went to funky town AND THIS MOVIE WAS BORN! Welcome to the world of Italian film making, WHERE RIP OFFS WERE BORN! In Italy, film making is a lot different. Originality is unheard of; it’s a lot easier to just steal from our great country. Like Escape from New York, this is based in the 90s; the Bronx is now known as “no man’s land.” The gangs rule over the place, the cops won’t touch it. Like in The Warriors there is “the good gang” called . . . now get ready for this, their name is so original! The Riders. Really? The Riders. Well, their leader, whose name is . . . Trash . . . saves a girl from a gang called THE ZOMBIES!!! Oh no! Yes . . . They look more like dirty toilet paper monsters. It turns out this girl is an heiress to the arms manufacturing giant The Manhattan Corporation. She feels a bit guilty, inheriting a morally questionable company, so, when she turns 18 she has the smart idea of running away to the waste land of the Bronx. When she meets the gang, she falls in love with . . . Trash . . . and joins in the gang. The Manhattan Corporation hires a ruthless and psychopathic mercenary named Hammer to find the girl. Trash’s best friend gets shot by this Mr. Hammer, and the gang goes on a rampage to find this man and take down The Manhattan Corporation. The only thing that stands out about this film is the part where they take the ashes of their fallen men and let them go by the twin towers. Ironically the ashes fly around the towers. Was it seeing the future? Most likely no, I think it just ended up that way. The gangs in this film are lame. The Warriors had guys with baseball bats, and this film has sparkly gold guys who dance! Escape from New York (even though it wasn’t shot in New York) had a good main character and a somewhat good story. This has a main character you don’t care about and a half baked story. One good thing about it? The music is pretty good, I love the theme song, but the music does not make up for the movie. You can already guess how I feel about this film: it’s bad. It tries to be something it can’t, and it’s just another lame copy cat from Italy. Nothing is new, there are many films like this made in Italy. Back then all they really cared about were the green backs, and that’s what they got.